Market observers remained tense throughout the weekend amid burgeoning skepticism that the stock benchmark Kospi might dip below the psychologically significant threshold of 2,000 this week, reeling under the prolonged US-China trade tension and visible losses in recent corporate earnings. Foreseeing further depreciation, especially in the market top cap companies, officials responsible for the securities sector are to put their heads together to devise countermeasures this week in response to the latest market crisis. The Korea Financial Investment Association will be holding an emergency meeting of local securities company chiefs on Monday morning, seeking to respond to the latest market situation, officials said Sunday. The urgent action came amid escalating anxiety that the downward trend in the stock market index might continue, possibly resulting in a fall below the 2,000 mark within the week, which would further dampen investor sentiment here. Asia’s fourth-largest economy on Friday set a new low for 2018, with its top-tier Kospi marking a 22-month low at 2,027.15 and its second-tier Kosdaq a 12-month low at 663.07, according to the Korea Exchange. Though key market giants managed to partly offset the fall on institutional buying at the eleventh hour before market closing on Friday, most of the country’s conglomerates were hit by a plunge in their market cap. The aggregated market cap for the top 10 business groups stood at 811.3 trillion ($710.1 billion) as of end-Friday, down 16.2 percent or 156.7 billion won from the end of last year, according to data released Sunday by corporate tracker Chaebul.com. Of the top 10, seven saw a double-digit fall in their market cap compared with the end of last year -- including Samsung Group, which marked a 15.8 percent or 81.2 trillion won drop from 514.3 trillion won to 433.1 trillion won. For runner-up Hyundai Motor Group, which shed 25.5 percent or 26 trillion won of its market cap, it was the flagship Hyundai Motor that took the biggest shock, seeing a 32.8 percent drop in the wake of the record drop in quarterly profit that it announced last week. Marking the steepest fall was Hanwha Group, whose market cap dipped 35 percent from 18.3 trillion won to 11.9 trillion won. Hyundai Heavy Industries Group was the only one among the top 10 to resist the free fall, seeing a 4.1 percent rise in market cap during the given period. In light of the ongoing trade conflict between Washington and Beijing, as well as the economic readings in the US, the possibility of a stock market rebound here remains low throughout November, observers noted. 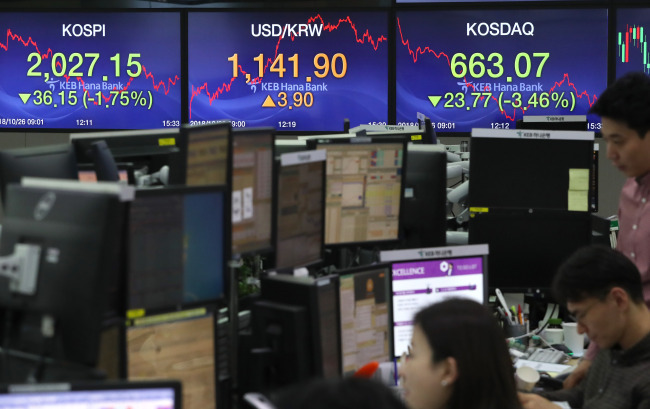 “Either a signal of diminishing US-China trade war threat or a slowdown in the pace of US rate hike should be a prerequisite for Korea’s stock market rebound, but both will take time,” said Lee Eun-taek, analyst at KB Securities. The Bank of Korea once again froze the nation’s policy rate at 1.5 percent earlier this month, keeping the rate gap with the US within its current range of 50-75 basis points, while the US Federal Reserve is widely expected to carry out another rate hike in December. Adding further to the market uneasiness here was the Composite Leading Indicator data released by the Organization for Economic Cooperation and Development earlier this month, predicting that Seoul’s business cycles will remain dull until the first half of next year. The corresponding figure for Korea was 99.2 as of end-August, down 0.1 point from the previous month and prolonging its downtrend for 17 consecutive months. A CLI figure under 100 indicates an economic downtrend for the following six to nine months.